The entire 3,200 square mile area is properly known as the Ngorongoro Crater Conservation area and is fiercely protected as not only a jewel in the Tanzania National Park network but as a designated World Heritage Site. The crater itself is the remnant of a volcano which, before its eruption, may have been larger than Mt. Kilimanjaro. It is the world’s 6th largest crater and has the distinction of being the largest unflooded, intact caldera. Rising some 8,000 feet high, you transverse the clouds to reach the rim road very near the top. Once the sun breaks out, the view is breathtaking – looking 12 miles across and almost 2,000 feet down, the crater is a self-contained world apart. To explore it thoroughly takes a full day game drive. A half hour drive down a steep, winding track brings you to the floor: grasslands, swampy lakes and a small forest. Those tiny black dots you saw from the rim you’ll recognize now as buffalo, or possibly as a lone bull elephant…for some reason elephant families stay in the highland forests surrounding the crater. The crater lake is home to both hippos and flamingos as well as thousands of other water birds. There are 2 picnic areas within the Lerai Forest and that’s where you’ll enjoy the boxed lunch supplied by your lodge. Persistent vervet monkeys will try their best to steal what they can; we witnessed one ill-advised tourist try to feed one of them (strictly illegal) and almost get his hand bitten for his trouble. 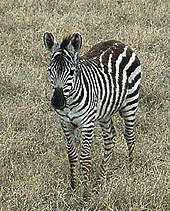 Don’t be surprised by encroaching zebra who seem to have little fear of humans on foot in this protected preserve. We saw several black rhino, Thomson gazelles galore and a rooting flock of crowned crane, magnificent as, startled, they flew off in unison. 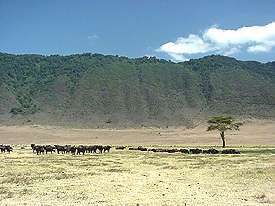 As a conservation area, as opposed to a national park, Masai tribesmen are allowed crater access for grazing and salt licks, but they must leave at night. The sight of their herds scaling the steep paths is a reassuring tribute to the real, peaceful coexistence between the wild and the human worlds.